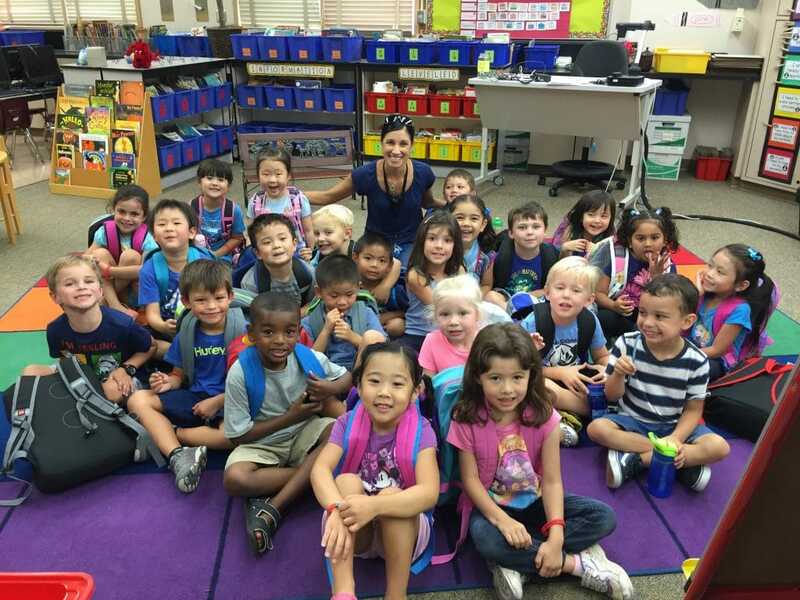 Our weekly blog post is to inform you, update you and share the school world of your Transitional Kindergartner! Feel free to give feedback or ask questions. What a successful Fall Festival! 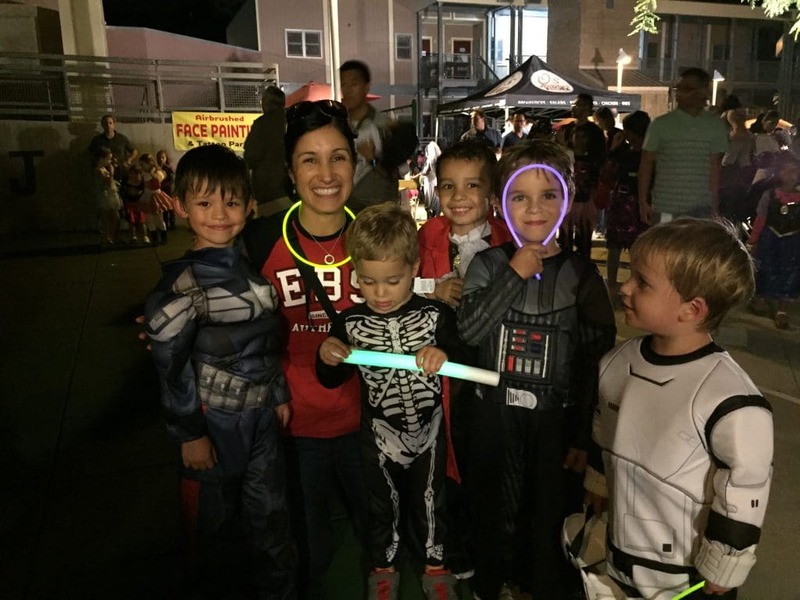 It was so great to see all the faces around school and to be there at night was an unusual treat that all the kids loved! With all the activities going on, the students seemed to be having an amazing time! So great to see many of you on Saturday Night! This week is the 206 Halloween Celebration! The students will rotate through a series of crafts and games! 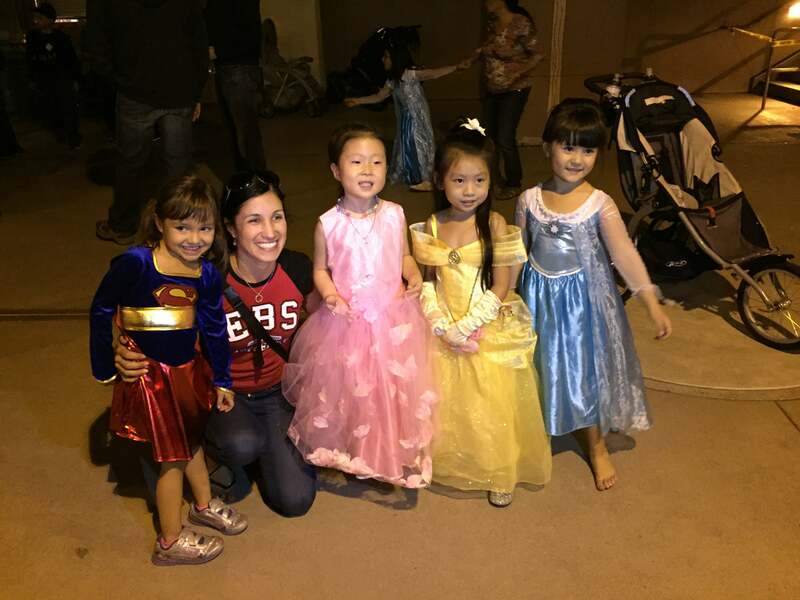 Three cheers to our Room Parents (Laarnie Chou, Liz Urenda, and Jeannie Smith) for planning this fun event! See the information below! WHAT: Room 206 TK Halloween Celebration! WHO: All 206 Students and cleared adults are invited! *A friendly reminder that students aren’t allowed to bring candy or wear costumes to school. Snacks and treats will be provided for each child at the party! (Write numbers from 0 to 20. Represent a number of objects with a written numeral 0-20, with 0 representing a count of no objects) as many kiddos, write certain numbers backwards. Parents write them in yellow first and then have your child trace them with a favorite color. • Don’t forget to check your child’s hand grip for good habits and correct formation. I have worked on this with some of the students for extra practice. Here’s a great little write up on pencil grip from the web to help… if needed, tuck a little cotton in the last two fingers to help an awkward grip from starting. This is our last week to turn in Super Pledge Envelopes. We are close to 100%! Thanks for all your support and participation! This week in our Fine Artists Lesson, the students learned about Nam June Paik. The students read a book earlier in the week about this artist and then practiced making a Paik Piece on Wednesday! Here’s a couple pics of our little artists! 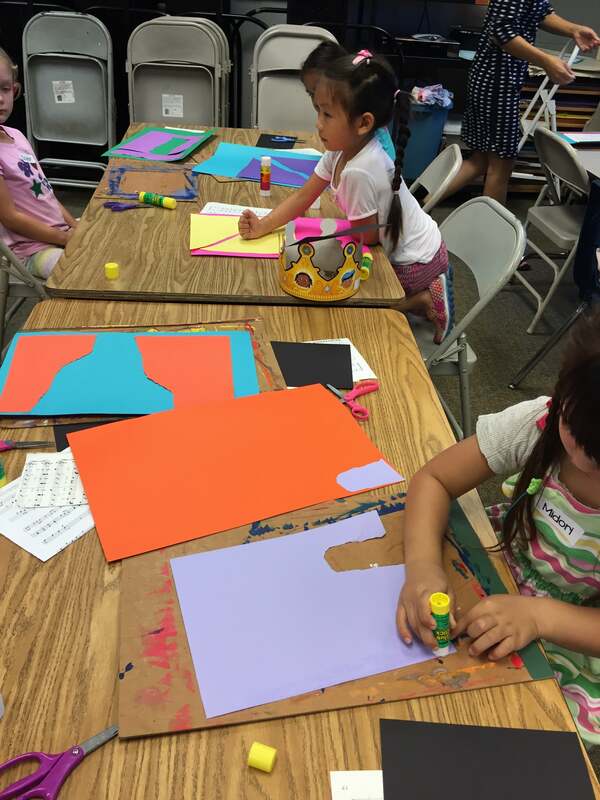 A big thanks to all the parents who came out to help with the lesson and our Parent Art Instructor…Megan Black! Some quick background info on Paik – He was born in 1932 in Korea and he was a musician, composer, and eventually created unique art using everyday objects. 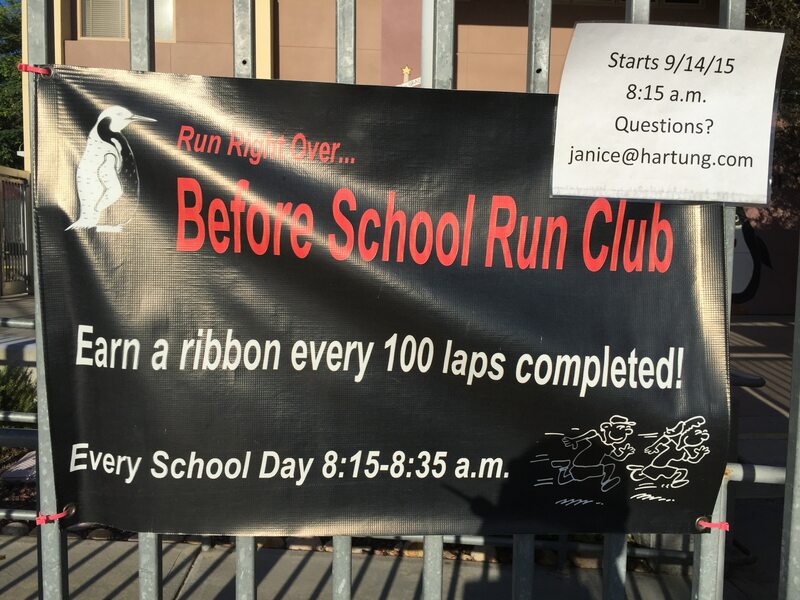 Please drop in the class when the gates open to go over directions ahead of time on how you can help that day! Thank you so much for your cooperation! This week Parent Teacher Conference sign-ups went home! Thank you for all of you who have returned it so far! These are due by next Wednesday as we will be creating a schedule, sending out confirmations and reminders as the dates get closer! Below are the directions to one of the websites the kids use at school. Get your child to the EBS website and see if they can do the rest. If they need a little help, here are the directions. Try to say the words below to help them remember what to do next. We say these phrases/words in the lab as well! How’d your student do? Great job kiddos! Due to the Halloween Celebration we will be wearing our Color of the Week (ORANGE) and having our Color Snack on Friday this week, instead of on our usual Thursday! Set a calendar reminder so you don’t forget! Thank you for all the feedback on Book Borrow Envelopes and on home reading! This is so helpful in choosing new books and in knowing how it is going at home! I have heard many of you mentioning the growth you are already seeing at home! You will see amazing growth this year with the consistency at home and school learning! Thank you for partnering with us in your child’s educational journey! On the back of this week’s homework, all the sight words we’ve gone over so far in class/homework are listed. There are enough now that you can start to play a little game that is fun and helps your child in reading these words. 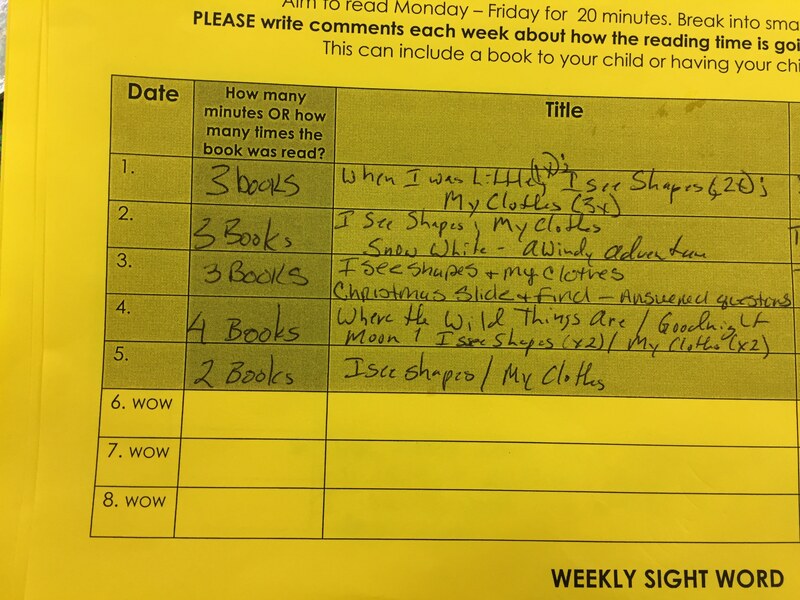 Check out the back of your homework log on how to play this game (“My Pile, Your Pile”) and continue to build your stack of sight words cards to play this game 1-2 days a week! Kids love it and its a great way to build strength in sight word vocabulary! One last reminder regarding Box Tops…. The next EBS contest won’t be for another few months, but you can continue to collect now! The winning class brought in about 600 Box Tops which helps the school immensely simply by cutting out the labels on many household products you use daily! Continue saving and have family, friends and neighbors save too! They are so light weight, that even family and friends can send them in the mail to you to help you collect! We had another great color week! The student’s dressed in BLACK on Thursday and had a yummy black snack (Oreos)! Check out our color picture! Next week will be ORANGE! Due to Halloween, we will be dressing up for color week/color snack on FRIDAY, October 30, instead of on our usual Thursday dress day! Thank you for our flexibility! Math – We continued working with our understanding of numbers 1-5 and practiced showing different combinations of these numbers. This can be done many different ways. One way to practice this at home is called subitizing. This is an awesome skill that builds great number sense and mental math ability. Read here to understand a quick background on this. 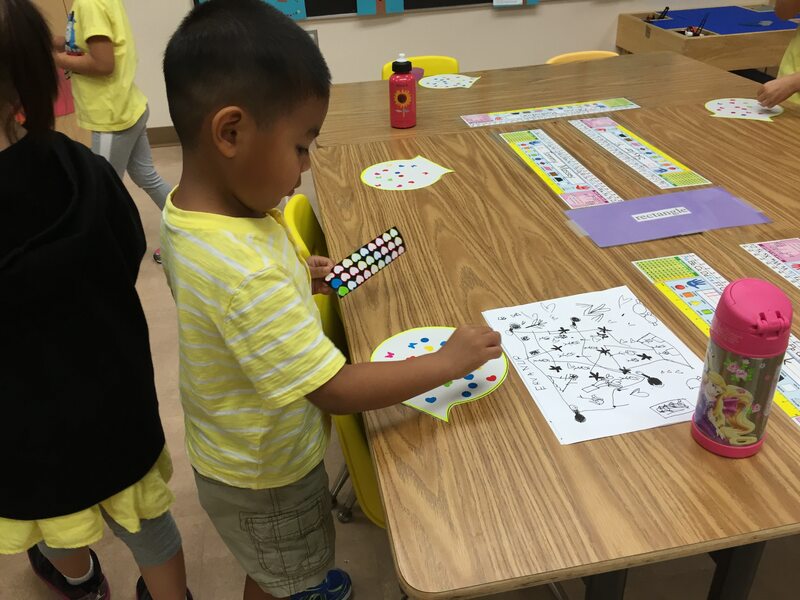 Then use the same dots purchased for the Reading Bookworm to create Dot Plates and do some quick Dot Plate Activities regularly for 5 minute practice sessions! These will also be in the put in the Resources page of the website. Writing – This week we spent time on writing stories/narratives (a sequence of events over time) to tell what happened First, Next, and Last in our story. For example I told them a story about an oven fire I had in my house. I drew the pictures and added words and numbered my pages 1, 2, and 3 to explain what took place first next and last. Have your child practice telling you a story of an event that happened at school, home, play date by telling you what happened first, next and last. Letter Cc – We practiced the /k/ sound and coming up with a list of C words. We introduced that “C” makes another sound…./s/. We practiced writing this important letter that helps us to write so many other letters. FYI…we use the “c” to make the letters …a, d, q, g, and the number 9. So many symbols that start with writing a “c.” The most challenging part of writing a “c” for the students, was writing that first part of the “c” that goes up and then around and down. Practice writing this letter at home. Start with the little hook line that goes up and then the rest of the letter goes down and around. See Calendar Dates Page on our website to see important dates for this year! Welcome to Week 6! 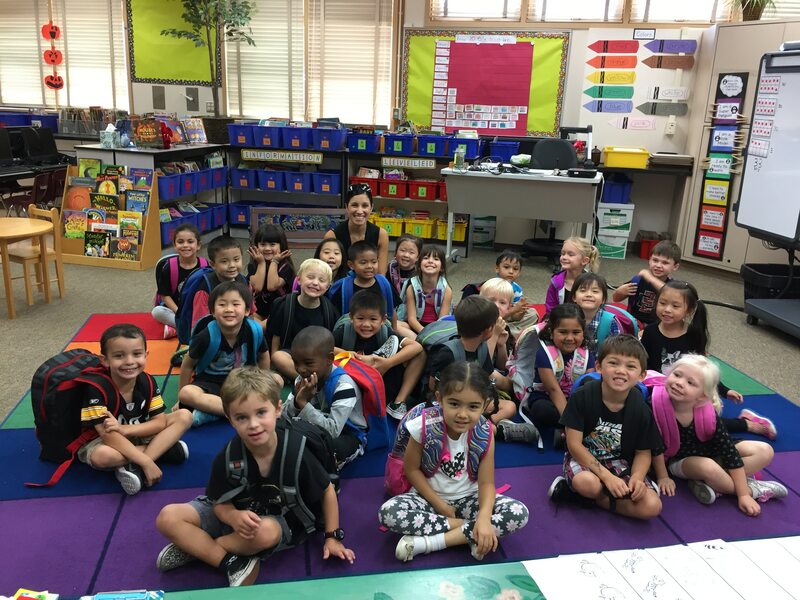 This post includes: •Super Pledge Update •206 Book Borrow •Box Tops • Classroom Volunteers •Homework •Fall Festival Basket •Great Shake Out (Earthquake Drill) • Last Week’s Color GREEN •This Week’s Curriculum •Future Dates •The Week Ahead • Heart GOAL! Our class is one of the many classes that have at least 80% of our envelopes in! If you haven’t already done so, please return your envelope so your child can get their bracelet and we can get all of our class pledge envelopes in! We have a handful left we need to turn in! Remember you don’t need to donate to return the envelope or get your child’s bracelet! 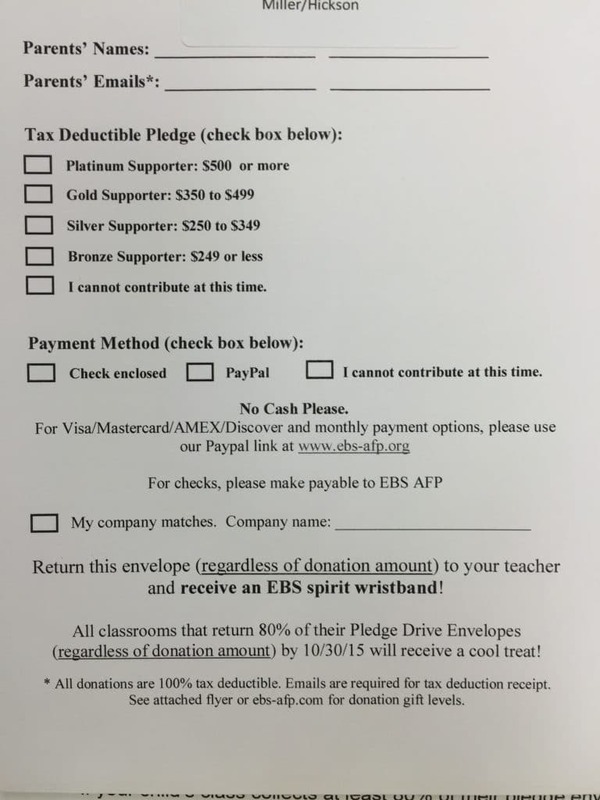 This is a huge help to EBS, to help fund projects like the new shade structure on the upper playground (if you haven’t seen it…check it out…its awesome!) and to create and run our computer lab and keep our classes sizes lower by hiring an extra teacher. 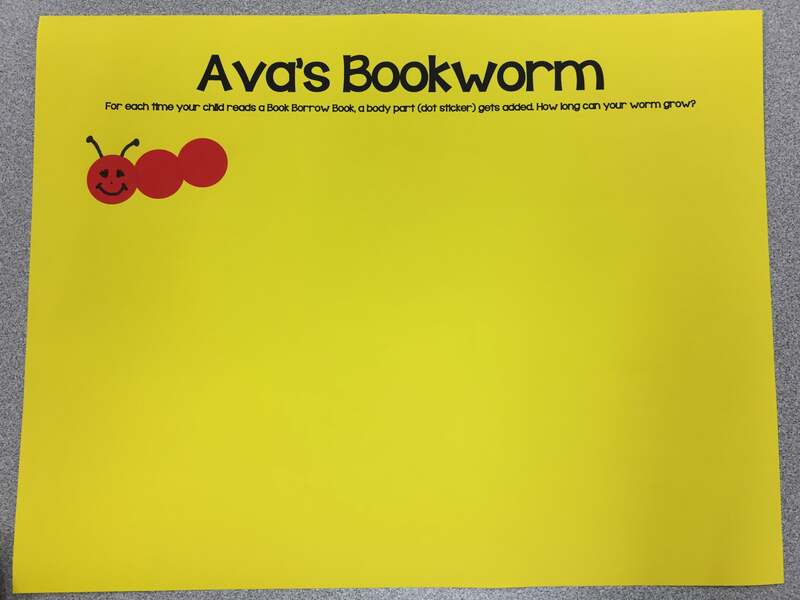 As per some parents requested, we tried sending home Book Borrow Envelopes on Friday instead of Monday so families could read some of their reading sessions on the weekend if they wanted to. This allows families to choose which days they want to do their 5 (or more if you wish) reading sessions. “My child is bored and doesn’t want to read the books multiple times…” – If your child, is bored or complains about reading the books multiple times/nights, try using the Bookworm reward. I will send home one worm with each child next week. Basically, your child earns dot stickers for each time they read a book by themselves. This helps to build motivation for rereading. See the sample below! Here’s an example of a bookworm that has 2 book read body parts added. “Our books are too hard/easy…” – If the books your child chose are way too easy on the first read, or too hard after 1-2 nights of reading, just bring the books in early and switch them out. You can also send a note on the books to let us know which books were too hard/easy or if you want to keep the books longer. See sample pictures of notes to direct next book choices. Thank you for everyone who turned in Box Tops these past two weeks. If you weren’t able to send any in…no trouble or fear! There will be another collection time in a few months so you can start saving Box Tops now! 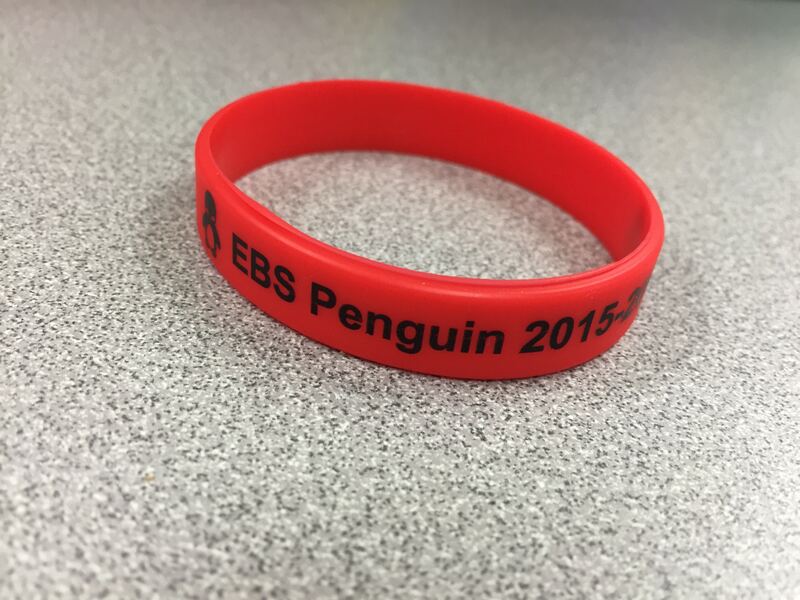 Thank you again to contributing to what makes EBS so amazing! Thank you to the Brenner family for advertising and counting the Tops for our class! If you are volunteering in the classroom, please feel free to come into the class a few minutes before the bell so I can go over how you’ll be helping our class that day. Thank you again for all your donated time to our kiddos! Thank you for all the comments and feedback on the homework logs. 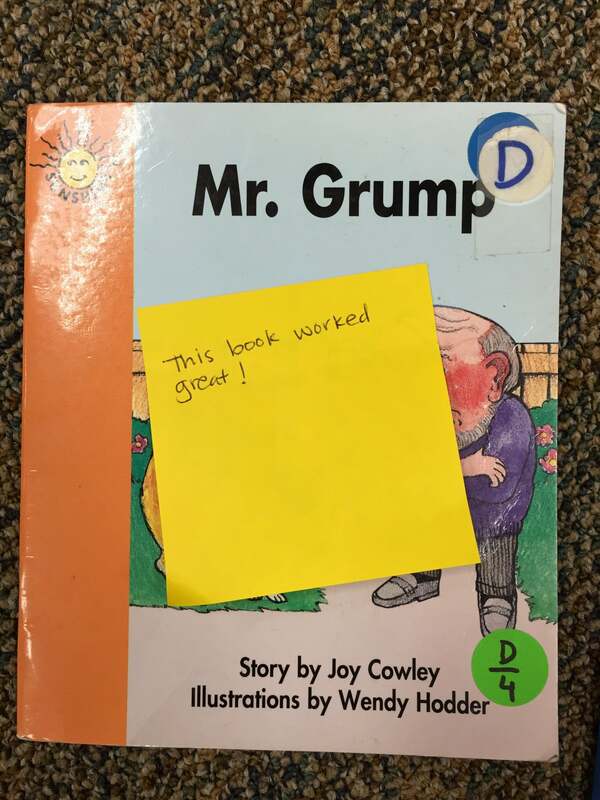 Its great to see how the students are reacting to reading at home! Thank you for the comments regarding the student reading and the comments regarding your discussions when you read to your child! A special thanks to Room Parents from Mrs. Offord’s class and our class for coordinating our Fall Festival Basket. It is beautifully decorated and is for a Family Movie Night Out. 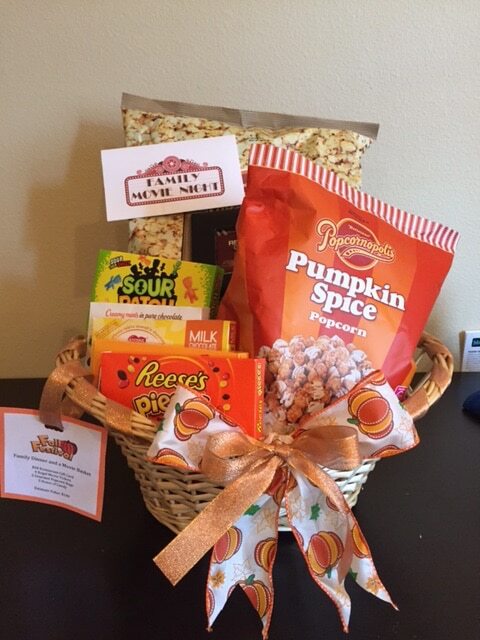 This basket will be at the silent auction during the Fall Festival! This past week our class and many other businesses and all schools participated in the Great Shake Out. This is a time for everyone to practice what to do in the event of an earthquake. 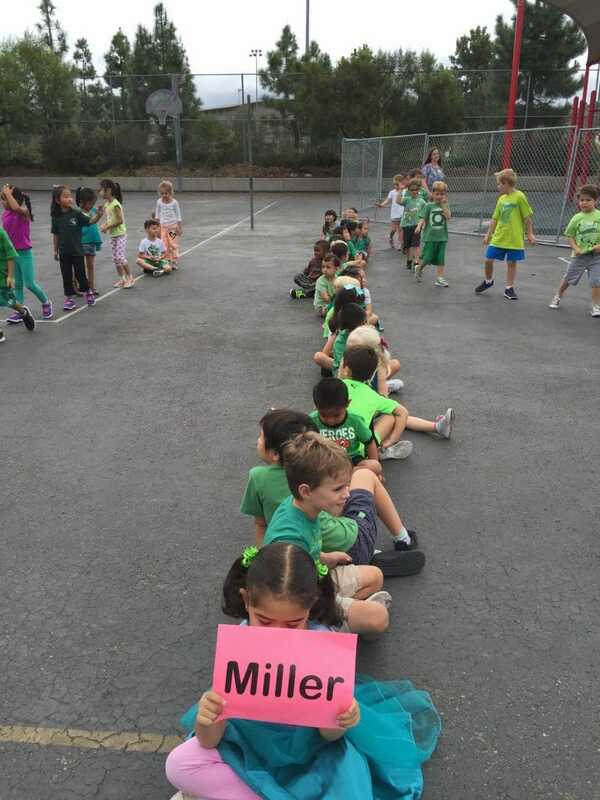 We discussed how in a “real” earthquake the ground would shake and then we discussed what we would do. Go outside and line up with all the other classes in the clear area. The students did a great job. Some of this was confusing as we spoke, but they did a fantastic job! We’re so proud of everyone! We read our poem about GREEN. 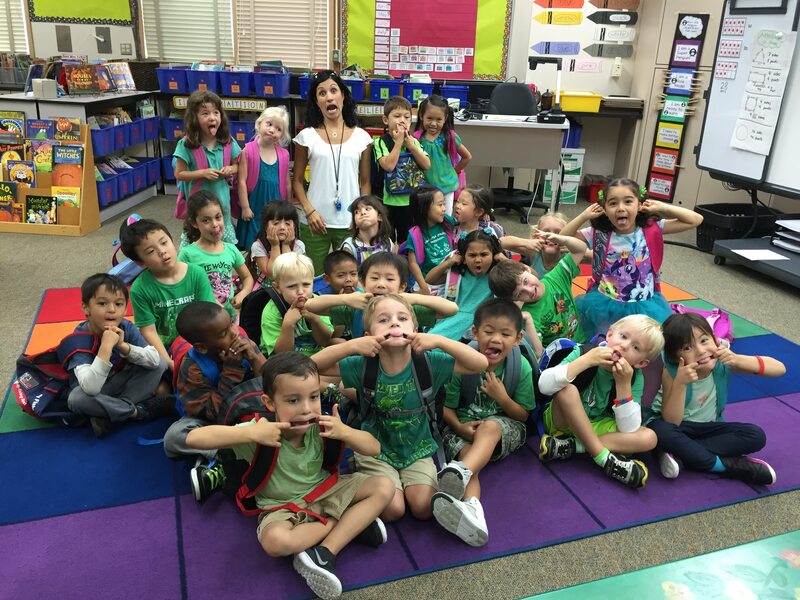 On Thursday, we all enjoyed a tasty GREEN snack and took our GREEN photo! 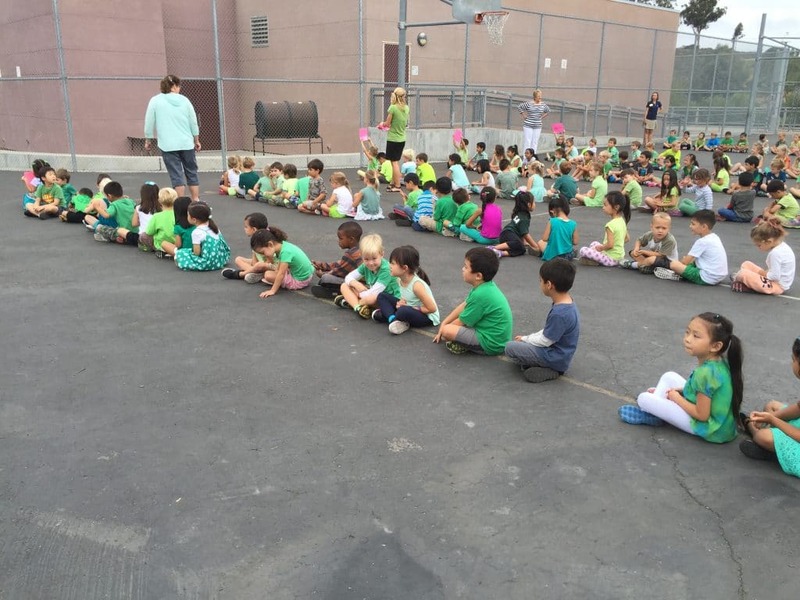 See our GREEN Picture below! Next week is BLACK…hunt for your BLACK outfit this weekend! Math – We continued our work on Numbers 1-5. This week, we practiced showing the number to understand the quantity attached to the symbol. We also spent some of our math time practicing adding and taking away cubes to build/breakdown towers to match the number given. Interactive Writing – This week we started using whiteboards during Interactive Writing. Our amazing volunteers created a Interactive Writing Bag for each student. The bag contains a whiteboard pen, a whiteboard, a felt eraser, and their name tag (with other supports on it). Each day the students have started the routine of writing their first and last name two times (as shown on their name tag) while everyone gets seated and ready to write. This was a new routine, but has been very fun! Once everyone is ready, the students, a writer in front of the class and myself will construct authentic text to make labels, signs, etc. in our room. Wear BLACK Day and have BLACK Snack! 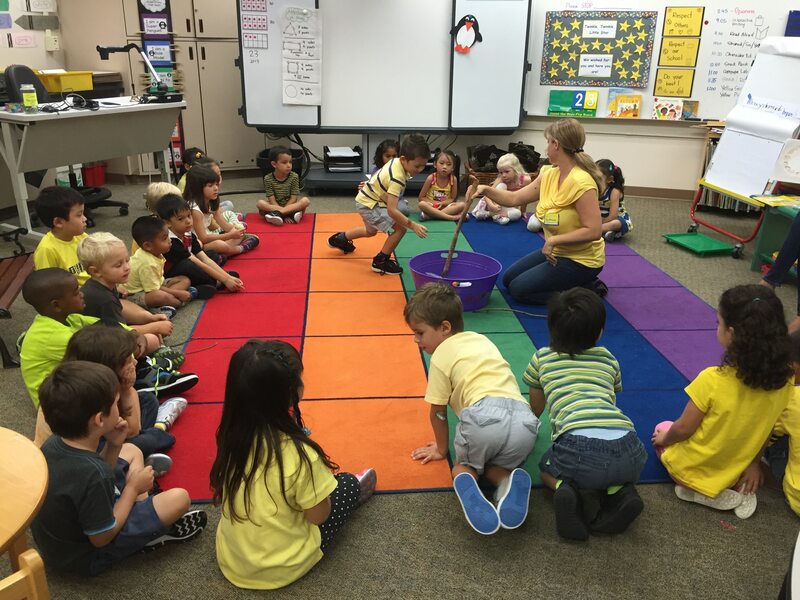 This week, Deb Marich and Ann Tran-Lien came in to teach our lesson on GENEROSITY! 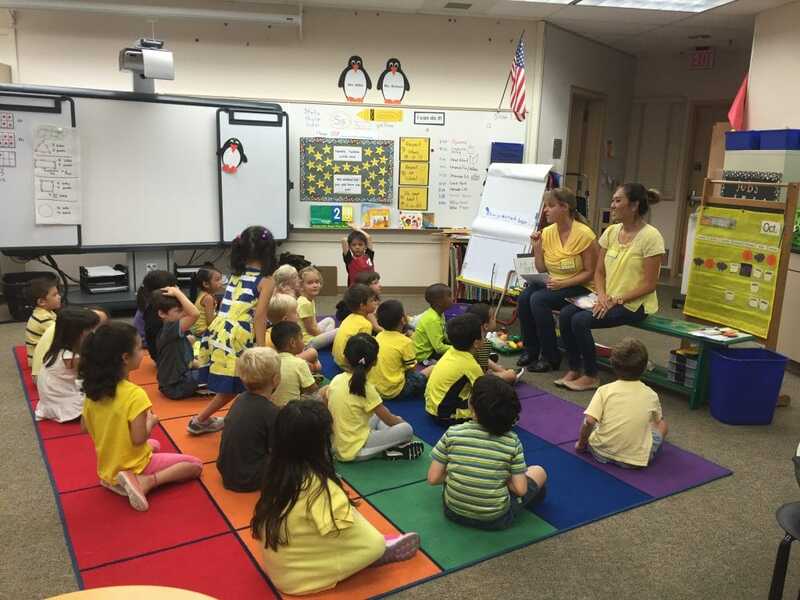 This is such a great lesson for our students to learn about, understand and practice (they even dressed in yellow!). These two Character Education Moms came in and talked about Generosity. Then they interactively read the students the book Stone Soup, while students got to contribute pretend food items into the class Stone Soup. After making our pretend Stone Soup and hearing the story, students got their own Stone Soup Pot and a sheet of stickers. Students were able to share ALL of their stickers on other pots to practice their generosity. This was a great intro and practice to kick off this trait. For some students, it took a little while to give away all their stickers to other pots as the concerns for their own pots. But they realized as they filled up other pots, their own pot at their desk was being filled up at the same time! Such a great lesson! Continue to practice using and encouraging your child to practice generosity with a sibling, neighbor, cousin or during a play date with a friend. Praise their efforts to give to others! Our class is one of the many classes that have at least 80% of our envelopes in! 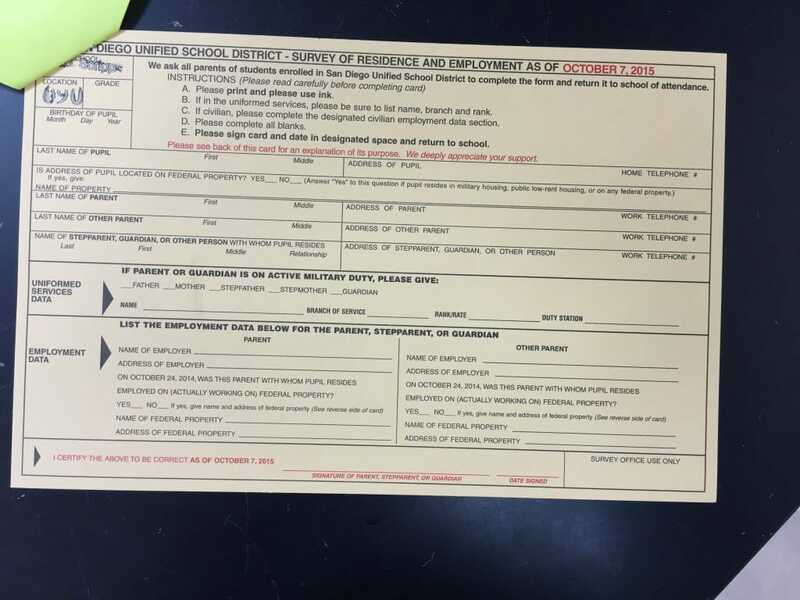 If you haven’t already done so, please return your envelope so your child can get their bracelet and we can get all of our class pledge envelopes in! We have a handful left we need to turn in! Book Borrow Envelopes will go home again on Monday. Remember to be reading these books repeatedly each night. For the early reading levels A-E, its extremely helpful to reread these texts multiple times. You’ll find that your child will likely memorize the book. This is common and typical for early reading and is a developmental stage of reading. Remind them to point to each word in these levels as well. If the books are way too difficult or too easy, return the envelope and we can trade them out. This may happen the first time or two as we find the right levels. The books may be a little difficult the first night as you support more that first night. By the last night your student should be able to read them independently. Celebrate the success at the end of the week! 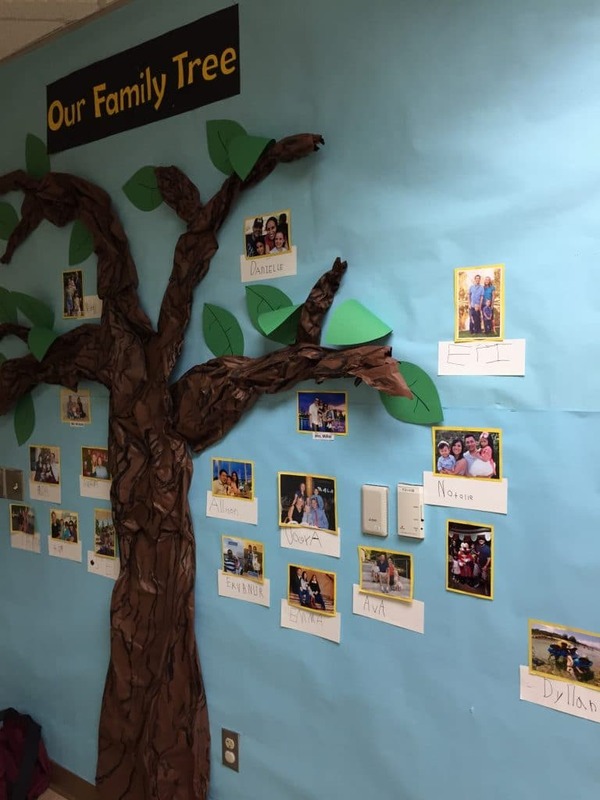 Don’t forget to send your family photo for the Family Tree Wall. Visitors and especially your children love to see the family photos on the wall! Please return these Monday if you haven’t returned yours already. Here’s a picture below of what the card looks like. We are checking off returned cards daily and turning them into the office as soon as we get them. Thank you for your help! Thank you Brenner for collecting our Box Tops to help our school! She put out an email to all parents and is picking up turned in Box Tops in the classroom. She also sent home an envelope in each child’s folder to make it easier. Feel free to use the envelope or any other baggie with your child’s name and Room 206 on it. The top 3 classes win prizes! Let’s see how many we can collect for this round! Volunteers – What a Village! Thank you volunteers for helping our village! I can’t even explain how grateful Mrs. Hickson and I are for all your help and offered time! You all together make this class so wonderful! 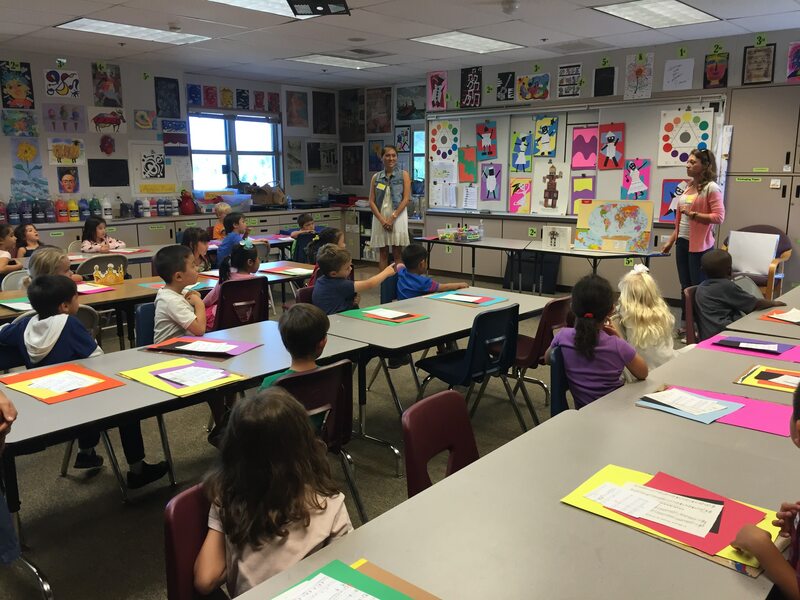 From Character Education to Fine Artists, Box Tops, AFP Liaison and helping in the class! We are so very fortunate to have you all in our 206 Family! If you are volunteering for the first time, I’ve updated the volunteer page to give some information to FAQ. Take a look and let me know if their are any additional questions. Thank you again for making our class and school so amazing! 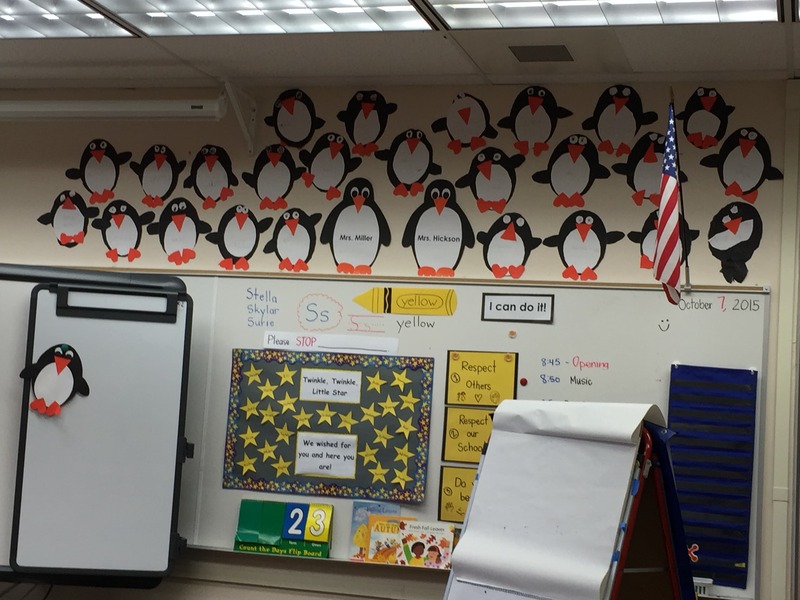 Here’s some awesome penguins (made by our fabulous TK’s) that our volunteers hung this week! As a reminder, read your Book Borrow Books each night 1-3 times each. Log these into the your Homework log. If you are reading the Book Borrow Books, you can log in the “Number of Times Read” instead of logging in the minutes for those books. If you are Reading To your child any books of interest you can log in the number of minutes read. If you do both, you can log in 2 separate reading sessions for that day (1. Student reading to Parent, 2. Parent reading to student). Thank you for your promptness in turning in logs and for all the parent comments each week! Thanks to our classroom volunteers this week, your child will be receiving a packet of math practice sheets to go home. These are OPTIONAL to complete and DO NOT need to be returned. There will be a information sheet stapled to the top, but I wanted to give you a heads up. The packet will be EXTRA practice for the math concept we are doing in class. Since these just got prepared, the initial packet is from the unit that we just completed. 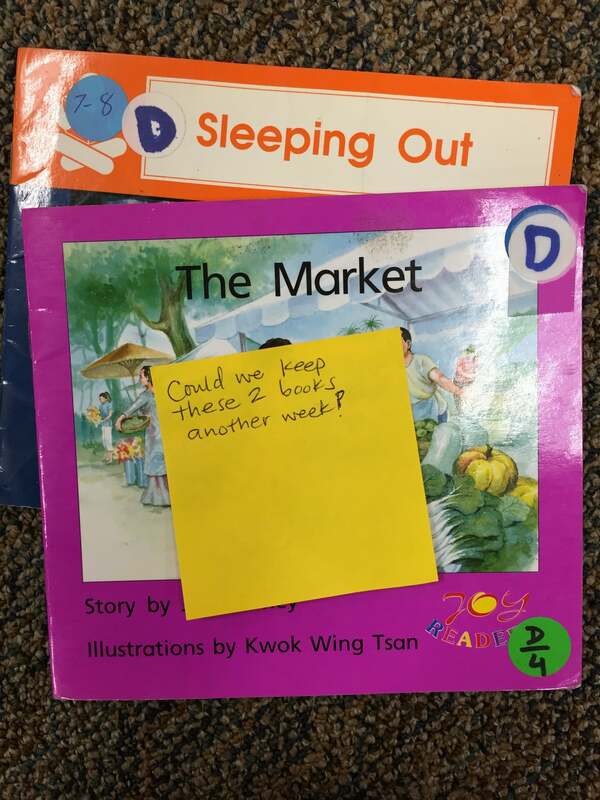 Here are some examples of TK Friends that are marking down the number of times read and rereading the Book Borrows each night. 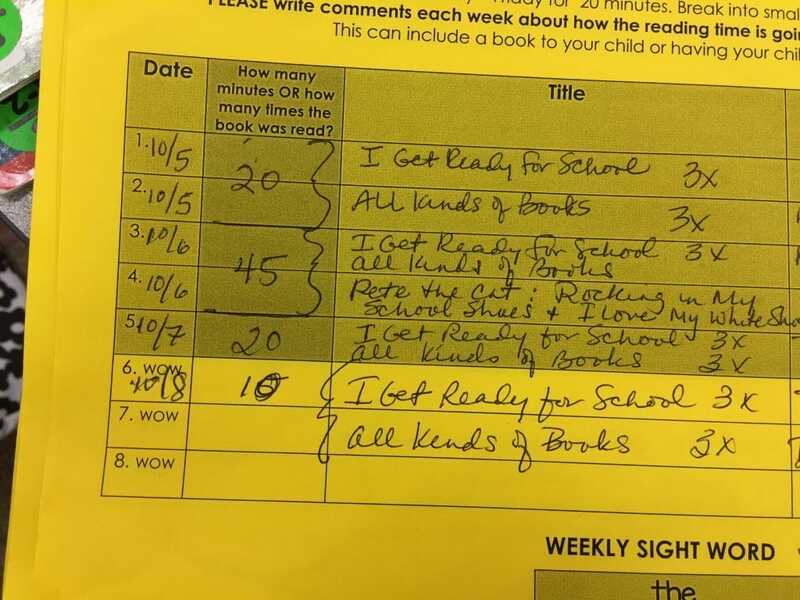 The log at the top also shows double reading sessions on the same day (one to your child and the other, the child to you). The students love ABCya and all the options that are available. This can also be used as an incentive to putting in reading time, if you student could use some motivation to do their homework reading. Here’s the directions on how to log onto ABCya. If you get your child to the EBS website, they will likely be able to get their on their own with a little help. Then choose from math, reading, etc. We will learn another website in the next week or two that your students will be able to do their leveled reading and add to their Homework log. In addition you can always visit our Links page (under Resources Tab) to see info on all the EBS links. 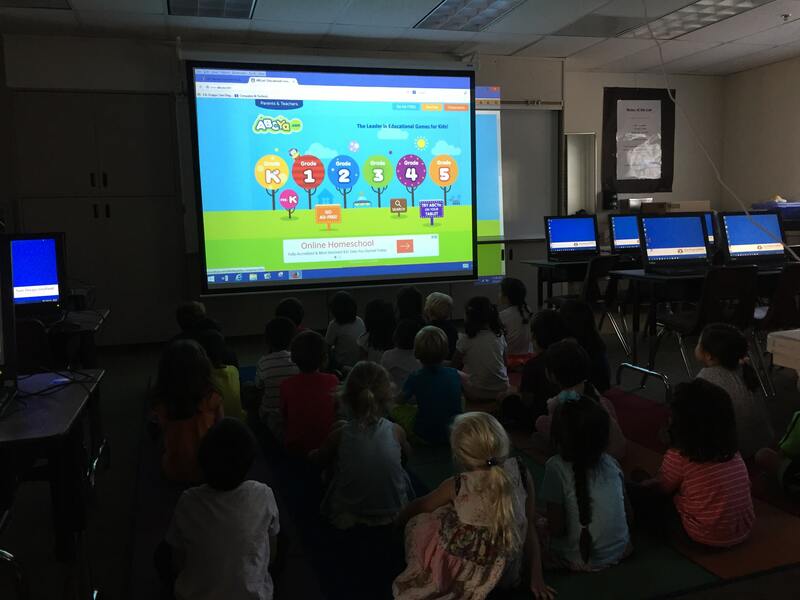 Here’s a picture of our kids viewing ABCya.com before they went out to try it on their own computer. 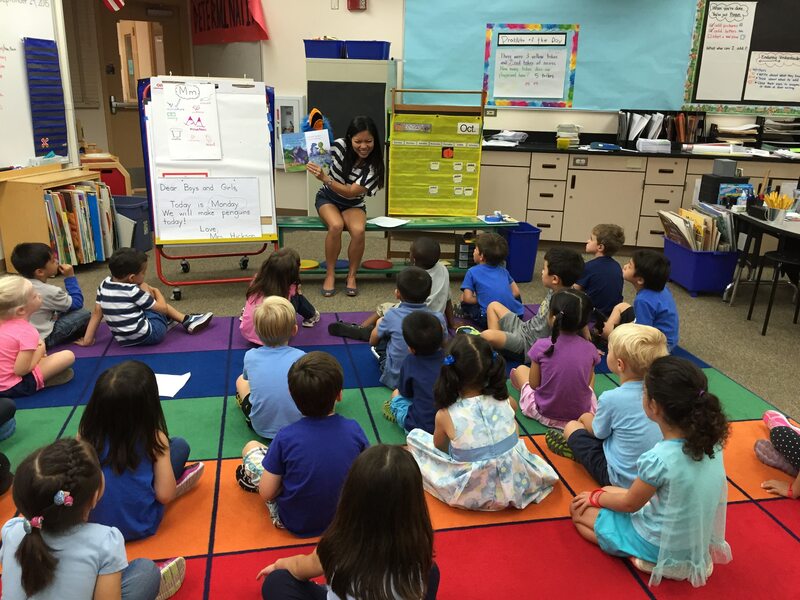 We read our poem about Blue, and even met our friend Blue Bird puppet during Character Ed. this week. On Thursday, we all enjoyed a tasty Blue snack! See our Blue Picture below! Next week is GREEN…hunt for your GREEN outfit this weekend! Have your child practice writing the symbols 1, 2, 3, 4, and 5. This can be done with pens, markers, rice on a cookie sheet, sand, etc. Write a number down and have your child match that many objects next to the number. Show them 5 items (beans, crayons, etc) and have them count the items. Then scoop some of them away (undisclosed amount) and see if they can tell you how many you are hiding. If this is too difficult with 5, try it with 4 items. Interactive Writing vs Writer’s Workshop: This week we spent a lot of time in Interactive Writing. This varies from our writing time in a couple of ways. During Interactive Writing, all students are writing the same message on either in the air, paper, white board, etc. We are practicing the conventions of writing as well as the formation of letters and the phonics of writing. Typically I’ll have students come up to hold the pen and write, while I model the same writing on a white board for the rest of the class. We come up with the writing choice of words together for an authentic purpose (a quiet sign to remind us to walk quietly). During our Writer’s Workshop time, we are focusing on multiple things and students are each writing their own piece/message. Typically we will do a mini-lesson on an area to try on. Then students come up with their own idea and go off and write on their own. Letter Ss – We practiced the sound that Ss makes and came up with many words that start with Ss. We practiced reading our Ss book. Look for Ss words/objects as you drive around. 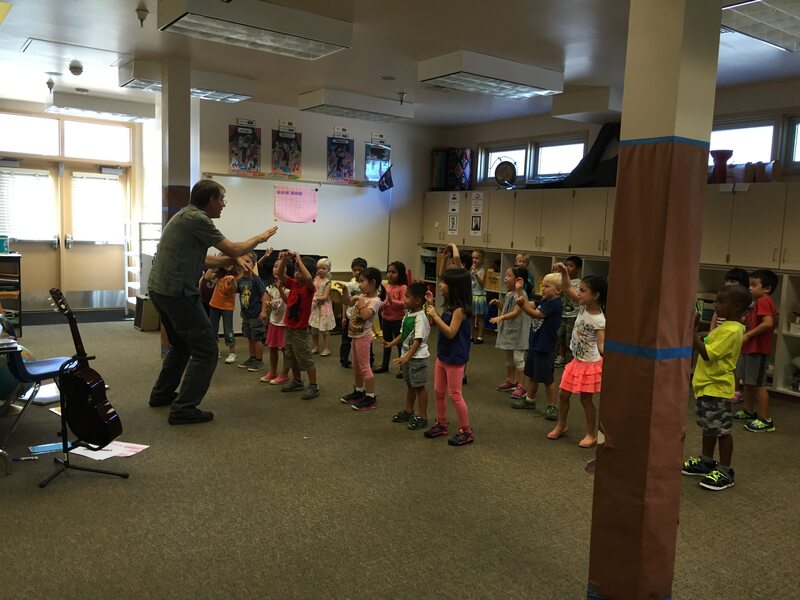 Here’s an extra pic of the kids having so much fun with a song and Mr. Waczek our music teacher! Our annual school Fall Festival is coming soon! Don’t forget to mark you calendars now so you can all attend! Its a great evening of fun! Friday, October 23rd @ 5:30! 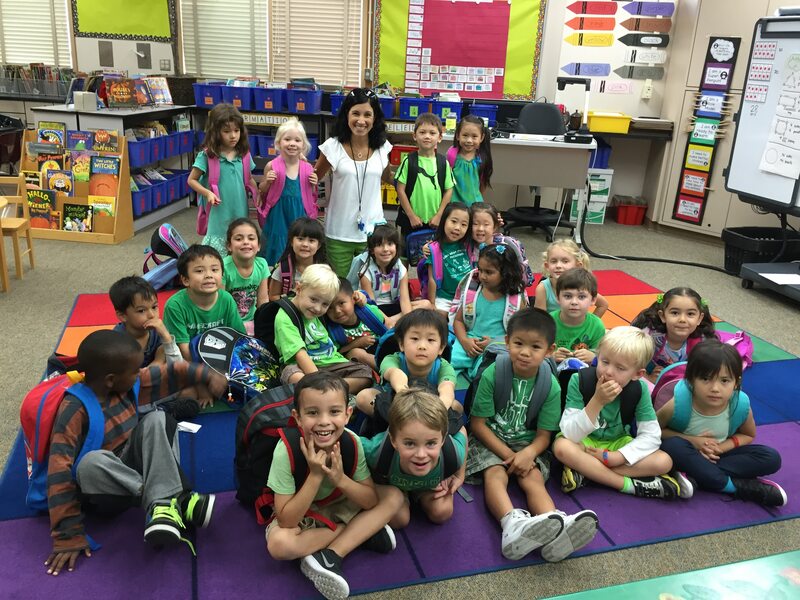 Wear GREEN Day and have GREEN Snack! Mission Federal is in front of EBS before school if you are interested in opening a special savings account for your child. From our wonderful Room Mom….. (applause)…. “If you have not done so already, please take a moment to read the email sent on 10/3 /15 regarding the non-curriculum events for this school year. Our 2015 – 2016 Room Moms are: Austin’s Mom – Elizabeth, Dyllan’s Mom – Laarnie, and Torrey’s Mom – Jeannie. We have teamed up to help make the first year of elementary school that much more memorable for your little one. Our mission is to plan the non-curriculum class events around holidays and/or certain school events/milestones, collect funds in support of the 25 children in the class and to manage the budget for Room 206. If you have further questions, please reply back to the email sent out. Thank you so much! 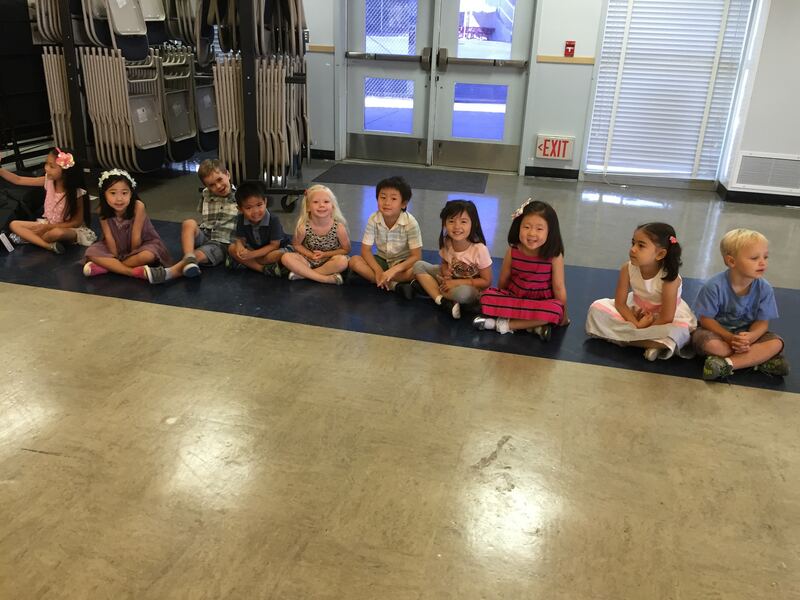 Those little kiddos are so cute and their smiles for Picture Day were equally as sweet! We were able to go over to the “photo” station first thing in the morning! 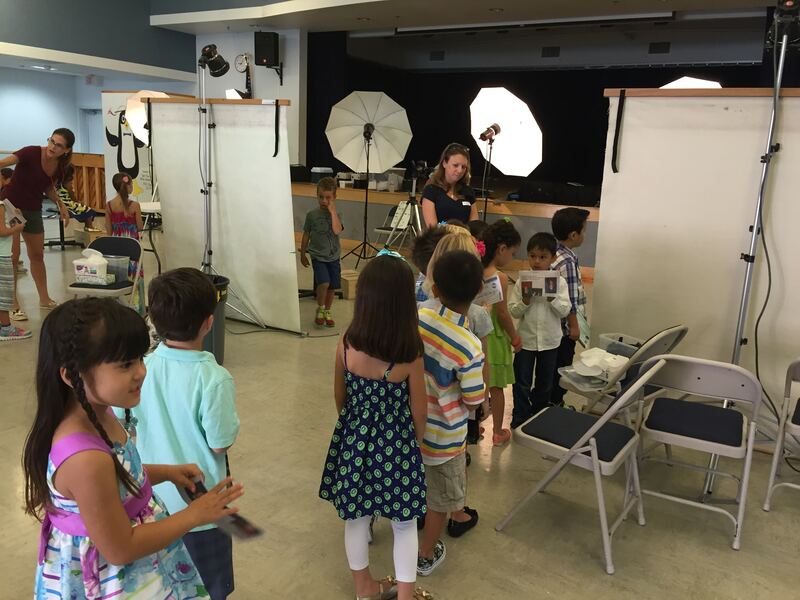 We waited in line as the photographers, posed each student and got them to smile! As the kids finished they waited on the sidelines with their friends until everyone was finished. Thanks to Megan Black for helping to put the finishing touches on each and every one! This week we had our first Character Education Lesson this week! 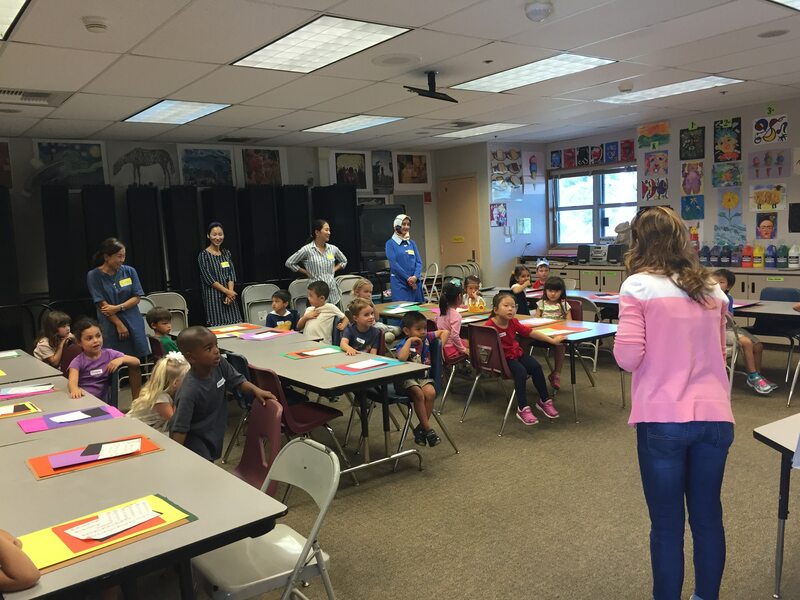 Our own parent, Laarnie Chou, did an amazing job in coming in to teach the students about September’s concept: Responsibility! 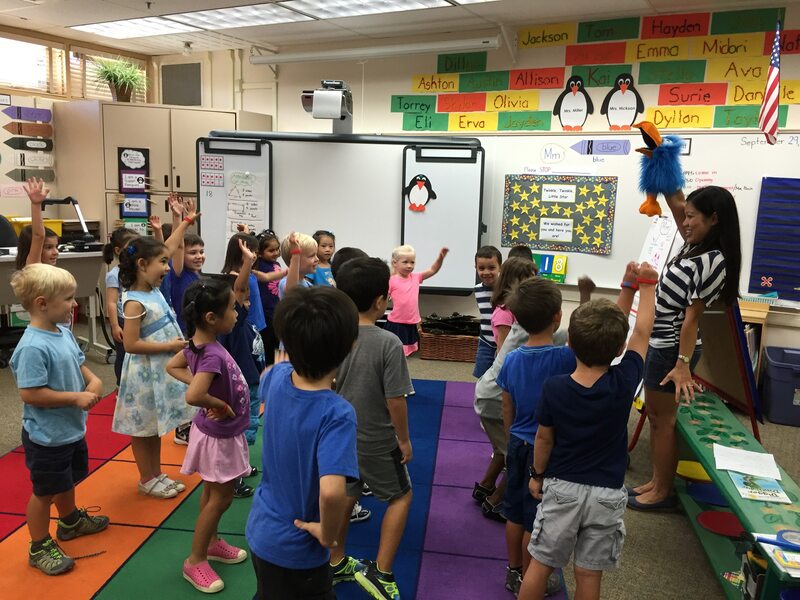 She brought in a Blue Bird Puppet to not only engage the students, but to tie into Blue Week! 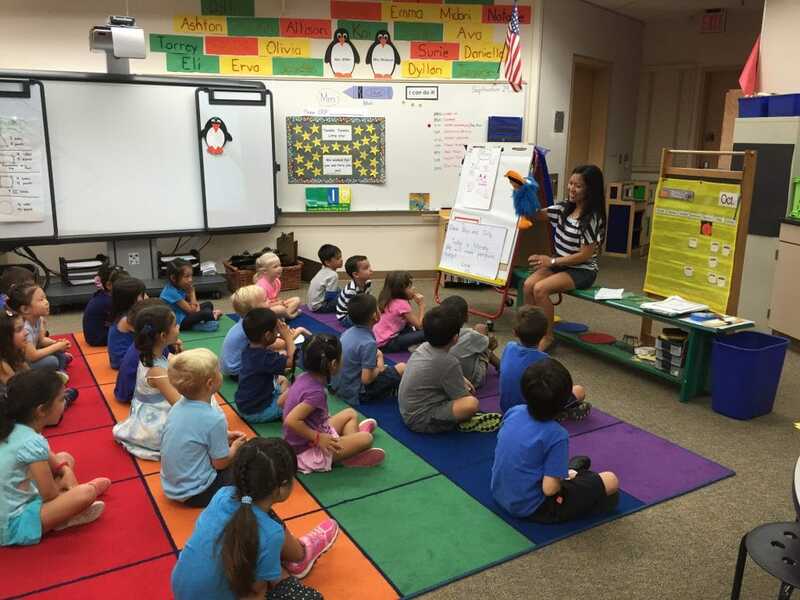 The students loved the Blue bird and listened to a story all about Responsibility. After they played a Simon Says type game with Blue Bird and finally they each got to feed Blue Bird a Blue cracker. We continue to review the meaning and the trait. You can also have conversations at home and start to use the vocabulary regularly with you child to strengthen their understanding of Responsibility within many contexts of their life! Book Borrow Envelopes went home this week for a trial run. Since there were only 2 days left, students only took home 2 books for practice. These books should go home every Monday and come back to school every Friday. Thank you for your patience for any glitches we may have this week in book choice or even in taking the folders home as one or two were left in class. These are to be returned in a tub right next to folders. 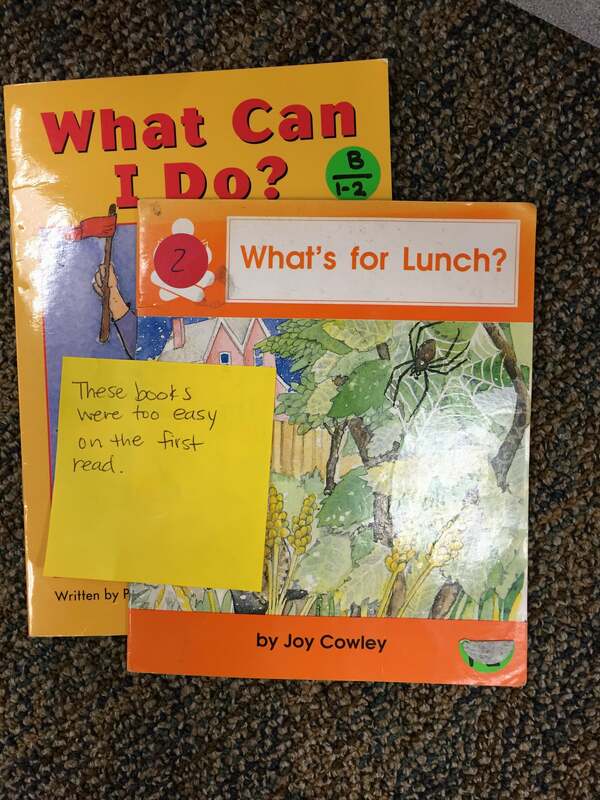 Book Choice… After assessing all the kids in their reading level, we can see their reading levels in which your child is able to read independently and instructionally. Independent (speaks for itself) as your child should be able to read these books all by themselves for the most part. Instructional levels are levels that are often just above their independent level and is the level at which they are receiving instruction. When sending home books, it would be ideal to get books that are mostly independent, but still have a couple words/parts that the kids have to work on each night. (See the notes regarding reading being similar to riding a bike on the green information sheet that went home in folders). One goal is book choice is to make sure it isn’t too hard as we don’t want the kids to be frustrated when reading. If the book is a little more challenging that usual, give a little extra support by reading it to your child a couple times first. If the book is too easy, have your child read it by themselves and return the next day for switch. If the book is extremely difficult, it likely wasn’t chosen well. Read the book to them and then return the book the next day for a trade. One final word on reading at home….MOST important above all is not about getting the words all right, but making sure that your child understands the book and what it is about. Fluent readers always read in service of meaning (emails, letters, documents, notices, novels, etc…). We want to make sure that our kids understand that is the purpose of reading. When learning to read, all the skills we learn are so that we can understand what the text is trying to say. Please make sure this foundation is the what starts your reading and a major guide in troubleshooting when your child hits a word they don’t know. This will not only send the message that reading is about understanding, but will also help them in making meaning errors/attempts (attempting to read “mug” but reading “cup” instead won’t change the understanding of the text) that won’t disrupt the meaning of the text when they read. (more details on guiding your child are on the back of the envelope). Now that Book Borrow will be going home you can Log both types of reading listed below. Both types are very important and are enjoyed by your young reader! Reading To Your Child: This is an opportunity to read books above their level and have rich discussions about stories or informational texts with your child. This is often a picture book or young reader chapter book, or a non-fiction text that peaks their interests. Stop and talk about the characters or what is happening or questions they might have to check for understanding. Having your Child Read to You: As your child reads their Book Borrow Books to you, they can read 1 of the texts 1-3 times in a night. Have them log this down in Reading Log. Volunteer CLEARANCE – – In order to volunteer in the class, you must be on Nurse Dee’s “CLEARED LIST.” Even if you were cleared last year, you will NOT be on this year’s cleared list until you fill out a volunteer application for 2015-16. You will not need a new TB test unless its been 4 years as it takes that long to expire. Check to see if your name is on the updated “Cleared List” posted on our classroom whiteboard by the backpack hooks. So many envelopes came back this week! We are on our way to a popsicle party! If you haven’t turned your envelope in yet, there is still plenty of time as the drive doesn’t end until October 30th. 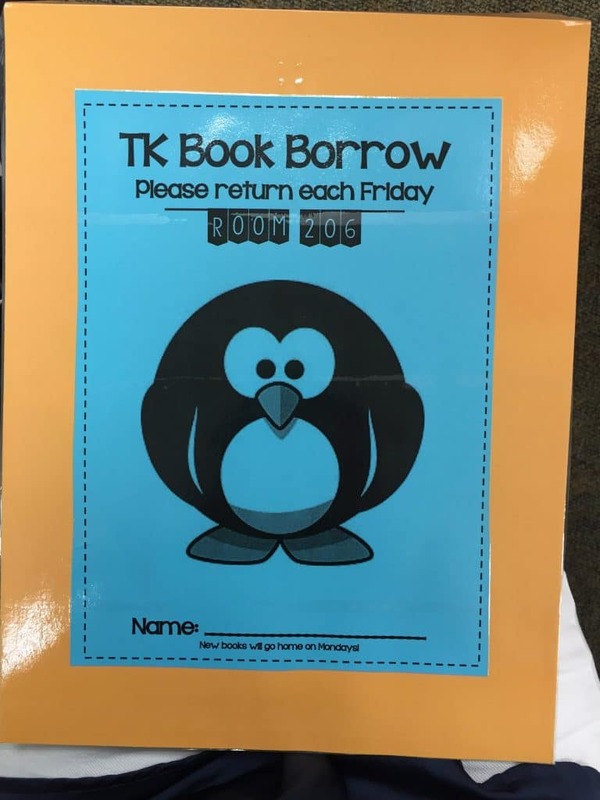 A little FYI…if you TK student is asking you to return the envelope (shown below) right away, it is because they want to get their penguin bracelet (also shown below). These have become quite popular with the students! Thank you in advance for any donations, as we are all part of the AFP and help to create this wonderful place! If you haven’t tried it out yet, come on Monday. I’m going to try and get out there on Monday to run with my daughter and would love to see you all out there! Details are listed below! 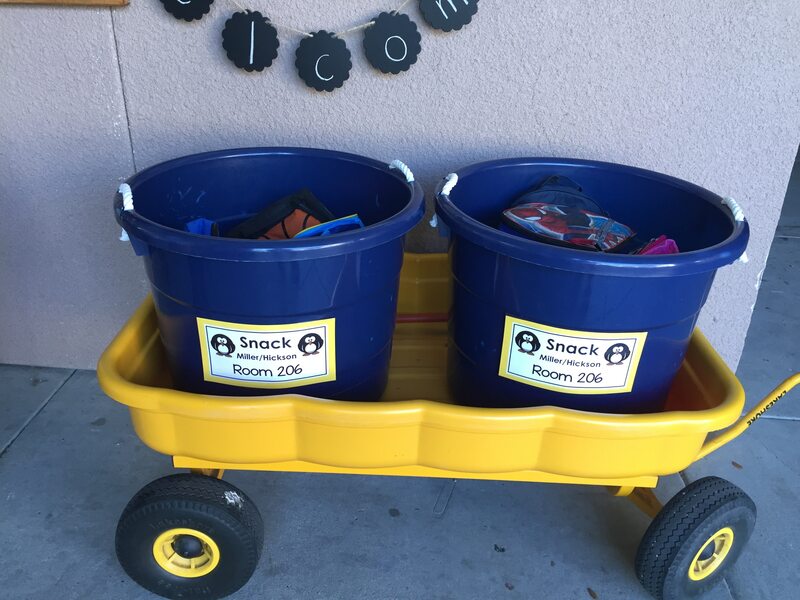 I relabeled our food tubs so they are both now “Snack Tubs.” Feel free to have your child put their snack bags in either tub. Thank You! We read our poem about Blue, and even met our friend Blue Bird puppet during Character Ed. this week. On Thursday, we all enjoyed a tasty Blue snack! See our Blue Picture below! 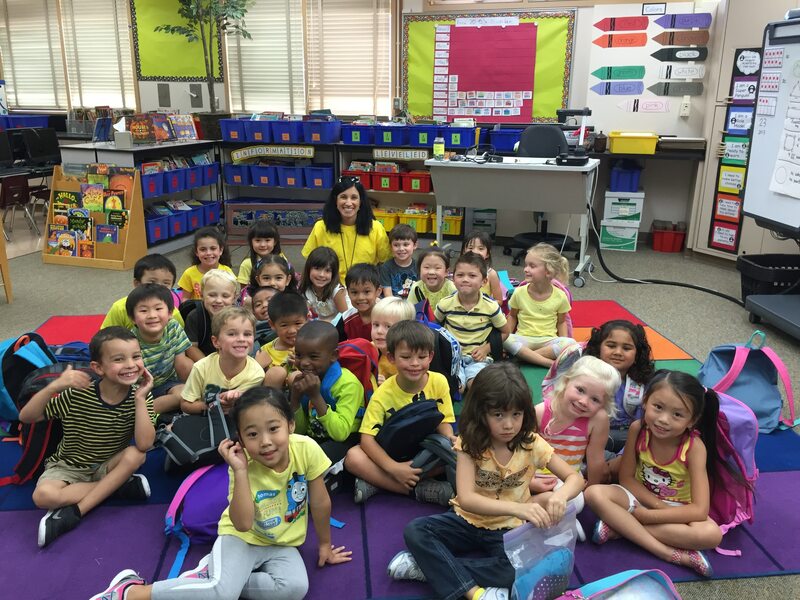 Next week is YELLOW…hunt for your yellow outfit this weekend! Math – As we finished up the sorting concept in math, we were able to assess all the students on sorting/classifying this week. Next week we will start our new math concept in Numbers. Letter Mm: This week we focused on the letter and sound of Mm. We read, practiced and colored our Mm book. We practiced the sound of Mm. We collected words that start with Mm. We also practiced writing the correct strokes and formation of Mm. What Mm words do you see around your home, can you practice writing Mm in the air, on paper, in the sand…remember to start those letters up tall! Reading – We have continued to read some of the old books we started in the first week of school for Shared Reading, but we also added some new poems and songs from our Song and Poetry Book. As we read through our familiar books we are practicing fluency in our reading so our mouths know what it feels like to read at a fluent pace. In reading new songs and poems we practiced using our pointer finger to point to the words we are reading and of course we spoke about what the book was about. Wear YELLOW Day and have YELLOW Snack!